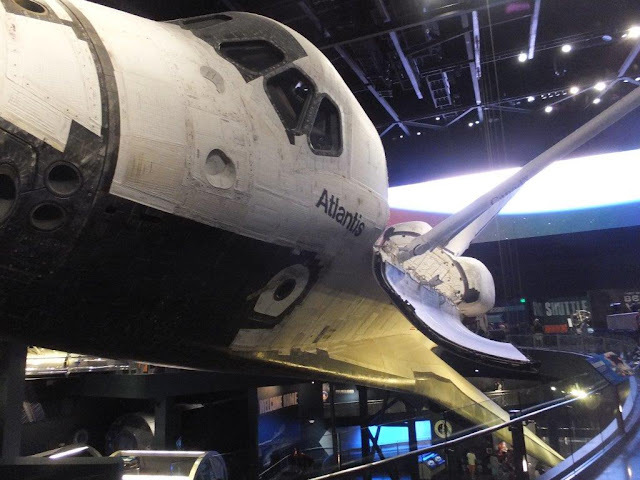 The Space Shuttle Atlantis was in service for 26 years. She launched as a Rocket, flew as a Spacecraft and landed as a Glider. The Kennedy Space Centre (KSC) was wonderful. If you were just racing through, it is entirely possible to do in one day. But if you were like us reading the exhibits, doing the guided tours and meeting the astronauts, engineers etc, then one day is not enough. Although, I think we achieved a lot in our one day. We went on an organised bus tour (Take Tours/Grayline), which left Disney’s All Stars Music hotel at 8am and picked us up again at Kennedy Space Centre (KSC) at 5:30pm (the Centre shuts at 6pm). We only saw half of what was there at NASA!! There is a tour bus on site that takes you to the Apollo/Saturn V centre and it is recommended to do this first. Make sure you sit on the right hand side of the bus! 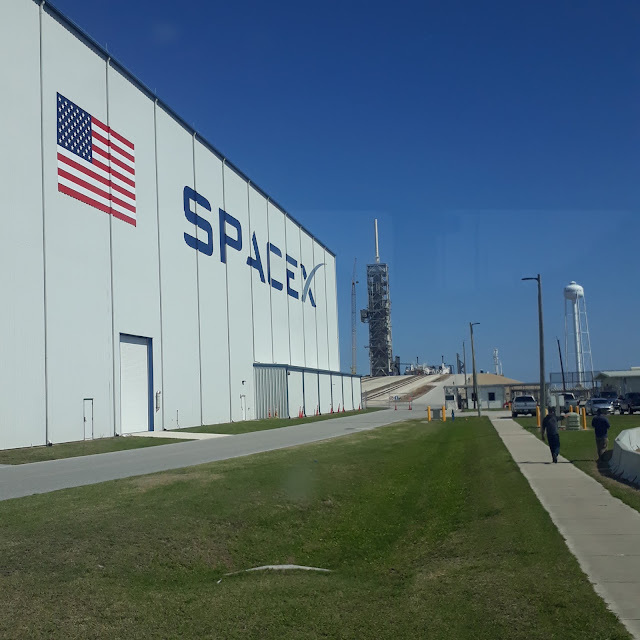 On the bus tour we saw the rocket launch sites, past and present (Space X) and launch viewing areas. There was a rocket launch the day before we went! 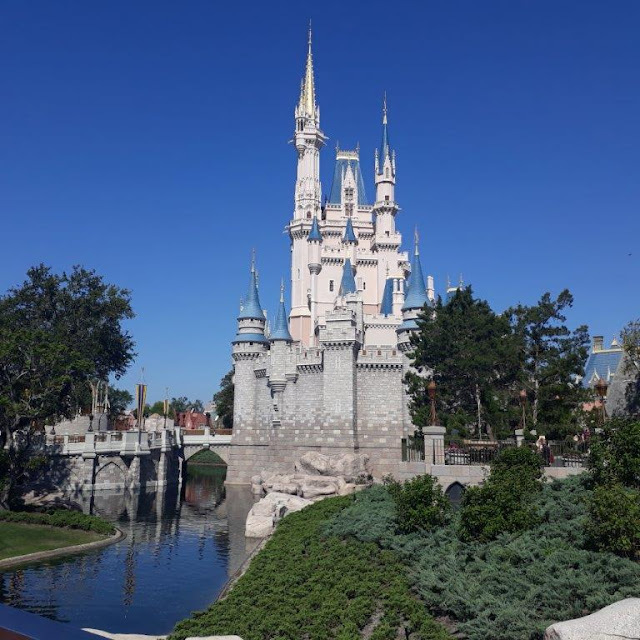 A lot of wildlife can also be seen from the bus– alot of alligators basking in the sun on the banks of the canals and bald eagles flying around (and their huge nests which are over a metre in diameter) can be seen frequently. You can see an Eagles nest near the centre of the picture! They are huge. The bus tour takes you past the ‘Vehicle Assembly Building’ (VAB) (pictured below). This huge building is where they actually build the rockets. It is so huge that it needs special exhaust fans to get rid of the clouds that form within the building itself! Once you reach the Apollo/Saturn V centre you experience a simulated rocket launch (loud and fun). This sets the scene for when you then view the Saturn/Apollo rockets - which are huge and impossible to photograph in their entirety (36 storeys high but displayed horizontally). We went on a 20 min guided tour for the Saturn/Apollo rockets – which I recommend as the guide pointed out a few things that I would not have known otherwise about the spacecraft. The Simulated Rocket Launch area. The layout and the consoles are real. The 'moon cars' required some assembly upon landing. On the tour we learned how much further the astronauts could explore with one of these cars, rather then walking! The seats looked pretty flimsy though! The Moon Landing module! It looks like something MacGyver would put together - but the foil was lightweight, able to be filled with Helium and fire resistant. We also met a retired NASA engineer who was available to chat as a volunteer to the public. He commented that there was always a lot of pressure on the workforce to ‘get things right’. 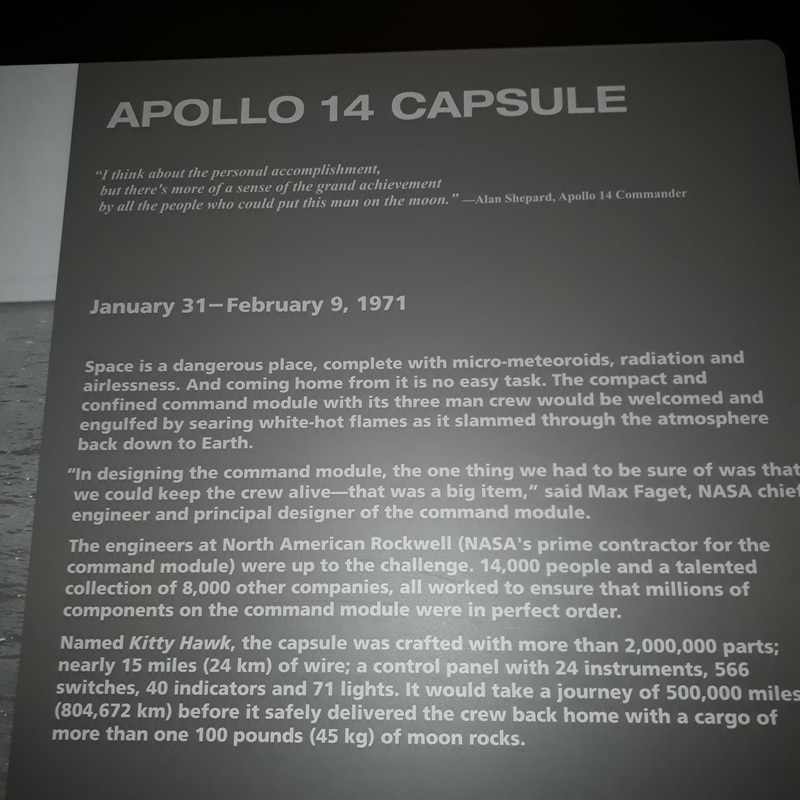 Also in this exhibition centre we watched a simulated moon landing (cool) and watched the moon landing module ‘land’. 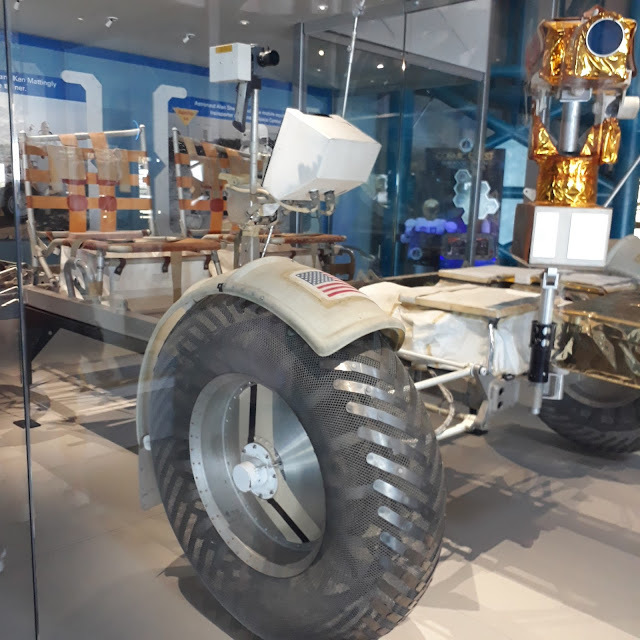 There were a lot of really cool exhibits including the moon ‘car’ (which requires some assembly on the moon! ), lots of history, space suits with moon dust- and fun facts -lots to read in different exhibits. Also in this exhibition centre is the transport vehicles that transport the astronauts to the rocket ships. They have specially designed busses for this that you can peek inside! 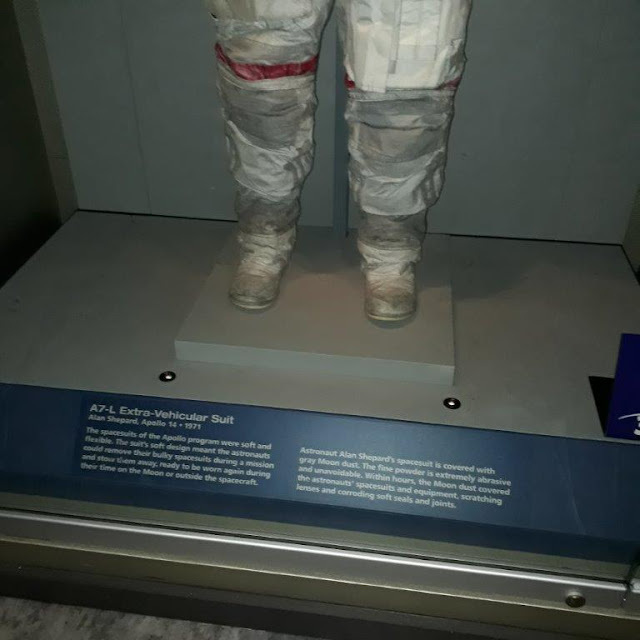 The Space suit from Alan Sheppard still has moon dust on the boots that can be seen! When we returned to the main Centre of the KSC we saw the Space Shuttle Atlantis. All of the exhibits at KSC had a ‘pre-show’ first before you saw anything – so it wasn’t like you just saw the Space Shuttle first. You had to do the show first (which took up more time) but also it was an excellent introduction to fully appreciate what you were seeing when it was finally unveiled (I thought that was a cool way of presenting these exhibits). This is the External Tank and Rocket Boosters for the Space Shuttle. More information below. The Space Shuttle Atlantis is huge. Again, difficult to photograph in its entirety. In the exhibition hall you could also view a video link to see what the people on the International Space Station were doing currently (I think they were sleeping!). 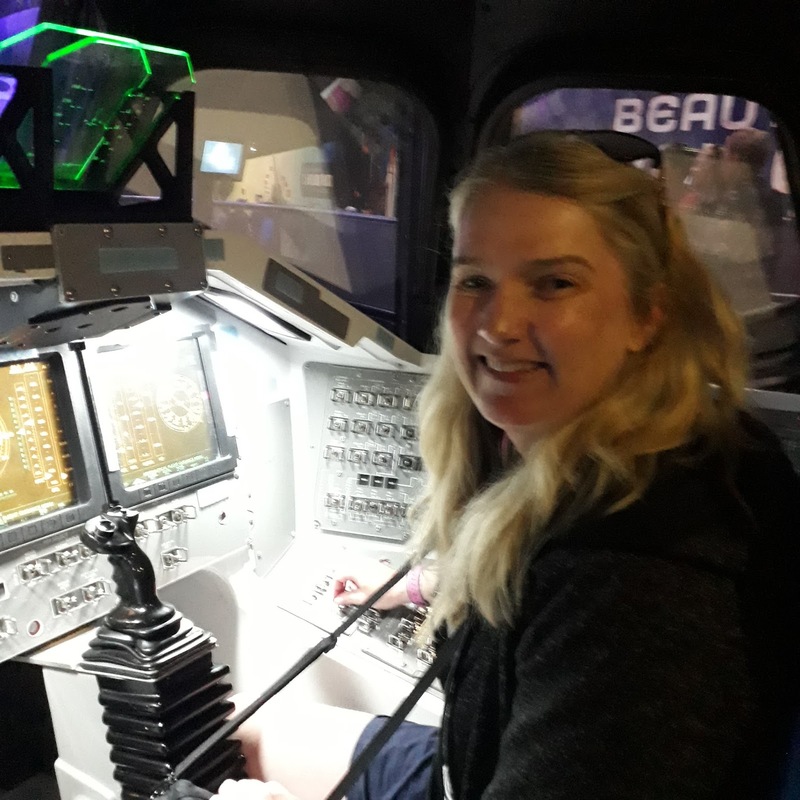 Me flying a 'Space Shuttle'. Lots of fun here! One of my favourite parts of KSC was the Astronaut talk. It went for about 45 minutes and was followed soon afterwards by an autograph session. Our Astronaut for the day was Bob Cenker. He was on the Columbia Space Shuttle in 1986. He detailed how everyone got ‘Space Sick’ but he said it was more like ‘Space Adaptation’. He explained how your heart is so used to pumping blood up to your brain, but in space, with no gravity, your heart can’t pump ‘up’. As there is no ‘up’. So it takes a few days of having bad headaches and feeling unwell for your body to adapt. But it does adapt! He said that also there were about 5 computers on board the Space Shuttle, and they all had the power to override each other if one malfunctioned (which they did from time to time). He said however, they had not ever been down to 'two computers' and what that scenario would mean. He also encouraged the audience to consider becoming astronauts (there was a large Australian school group at the seminar). He said you don't necessarily have to be a test pilot or a pilot to be an astronaut. Scientists and Engineers are recruited - you just need a degree. Q 1: Does everyone get over ‘space sickness’? His answer was yes. People take 1.5 days on average but everyone does get used to it. Q 2: Also, during the talk, he mentioned that he could not fly the Shuttle. He was a scientist not a pilot. The Space Shuttle had a pilot and co-pilot and he was not expected to fly the shuttle. I asked him whether he had any training at all – in case something happened to the pilots? – Bob said there was indeed no flight training provided. He said that if something had of happened to the pilots, that NASA would have guided them through the flying of it (he kind of indicated that NASA could control the Shuttle themselves quite a bit from Earth). 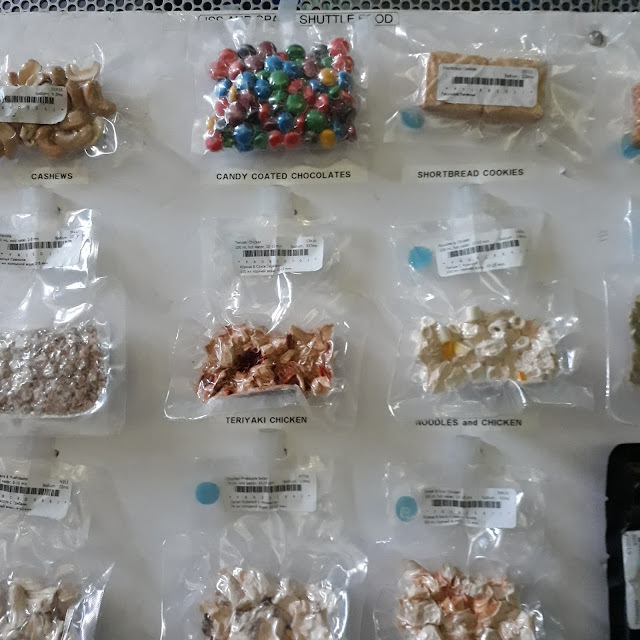 Also, near the Space Shuttle exhibit, there was also a fine tribute to Challenger and Columbia disasters, with each astronaut having a few mementos about their passions and reasons for being on the Shuttles displayed in cabinets. I do remember the high school teacher Christa McAuliffe very well – she was supposed to be the ‘first civilian’ in space when the Challenger shuttle exploded. My husband did the motion simulator ride of a space launch which was fun. It was very loud in the beginning of the ride but not scary at all. It took over 30 mins however to do the whole experience. We missed unfortunately the two IMAX movies (they go for about 45 minutes each), the Mars Rovers exhibits and the Heroes and legends new exhibit (regret missing that one!!). We ate lunch in the bus line so we weren’t ‘wasting time’ (and we took our own food as Kennedy is known to have few food choices for fussy eaters). 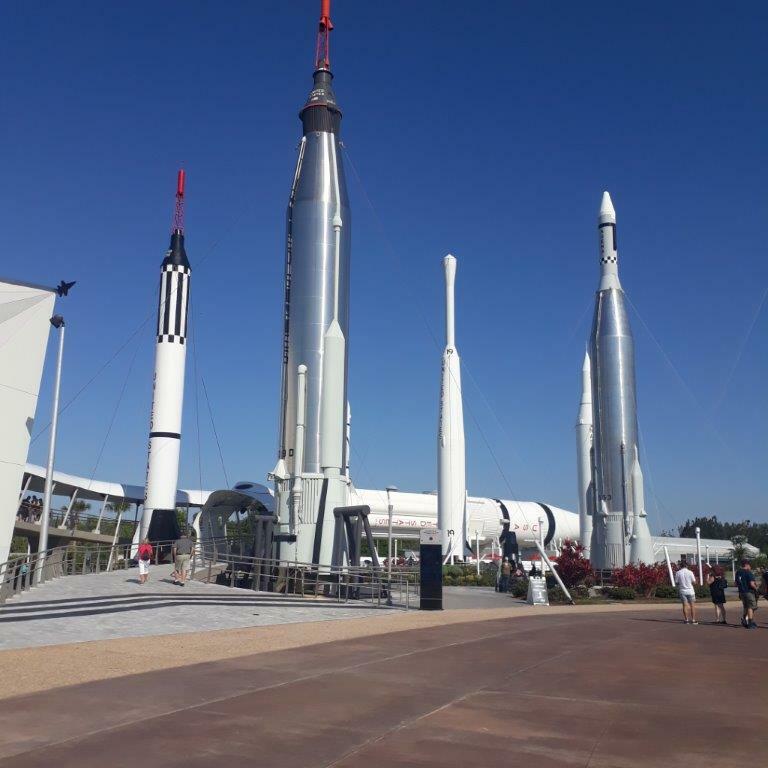 The Kennedy Space Centre seems to change the astronauts weekly and you can do other bus tours (check their website). There is so much available. One thing I found was it got to about 4:30pm, and we didn’t have time to do anything new! The shows were either over for the day or took longer then our deadline back to the bus of 5:30pm, so the last hour at the centre was kind of ‘wasted’. Although we had a lot of fun in the shop! The astronaut pens had sold out unfortunately. I would have loved one of them! 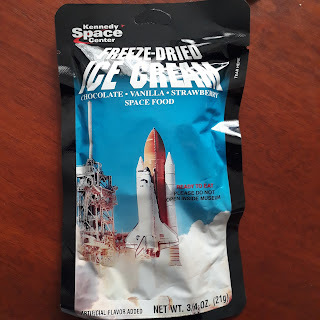 The shops had cool items like astronaut icecream- at reasonable prices. The KSC has so much history and such an incredible future ahead. It was quite a sombre, inspiring, uplifting and an emotional experience. I totally recommend a visit here! This quote below was displayed at the KSC and resonated with me throughout the entire visit – at various points around the Kennedy Space Centre from the Saturn/Apollo Rockets, to the Space Shuttle, the disasters, to the new Space X program and the future in Space Travel. This post is amazing. I really want to stretch the word amazing. All these things gave me goosebumps and I remember the day when Columbia disaster happened. Thanks so much Gursimrat. We were so impressed by the Kennedy Space Centre. You could really spend a couple of days there not just one. It was a very inspiring day!